Delegation including Ivanka Trump, Jared Kushner arrives at Ben Gurion Airport ahead of ceremony marking US embassy move to Jerusalem. 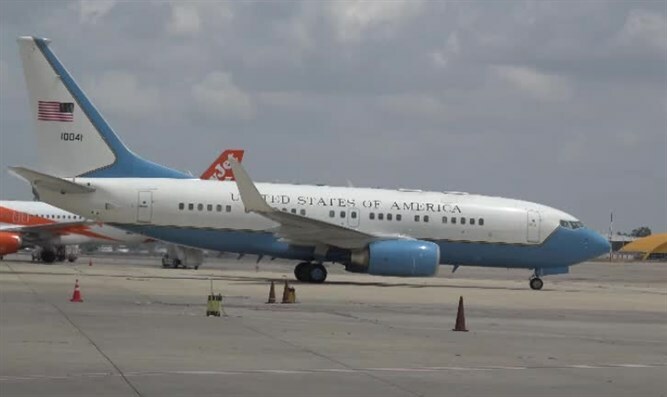 A US delegation has landed in Israel prior to the ceremony for the transfer of the US Embassy to Jerusalem. The delegation includes Trump's daughter Ivanka and her husband Jared Kushner, US Treasury Secretary Steven Mnuchin and US Deputy Secretary of State John Sullivan. Following reports that US President Donald Trump might be attending the ceremony himself, it was finally confirmed last week that he would not be attending, but that he would send his daughter and son-in-law in his stead. Trump announced the relocation of the US embassy from Tel Aviv to Israel's capital of Jerusalem in December. Other nations will follow the US in opening embassies in Jerusalem this month. The Guatemalan embassy will open on May 16. It was also announced that outgoing Paraguayan President Horacio Cartes will visit Israel to open the Paraguayan embassy in Israel at the end of the month.